As a mechanic, you must be able to locate and correct cooling system problems quickly and accurately. It is equally important that you know how to service a cooling system. The original additives in antifreeze fight rust and corrosion breakdown and are ineffective after 1 to 2 years. This is because of the continual exposure to the heat in the cooling system. After the additives break down, rust begins to form rapidly. Therefore, a rust- colored antifreeze is an indication that the cooling- system service is required. The cooling system should be cleaned periodically to remove rust, scale, grease, oil, and any acids formed by exhaust-gas leakage into the coolant. Recommendations vary; for example, Chevrolet recommends that the cooling system be drained and flushed every 2 years. Flushing (cleaning) of a cooling system should be done based on the manufacturer's recommendations or when rust and other contaminants are found in the system. Flushing involves running water or a cleaning chemical through the cooling system to wash out contaminants. Rust is very harmful to the cooling system because it causes premature water pump wear and can collect and clog the radiator or heater core tubes. There are three methods of flushing-fast flushing, reverse flushing, and chemical flushing. 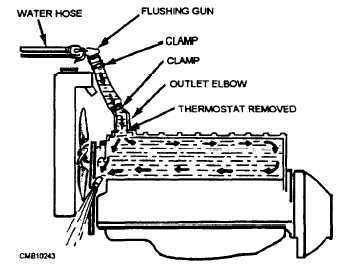 Fast flushing is a common method of cleaning a cooling system because the thermostat does not have to be removed from the engine. A water hose is connected to a heated hose fitting. The radiator cap is removed and the petcock is opened. When the water hose is ON and water flows through the system, loose rust and scale are removed. 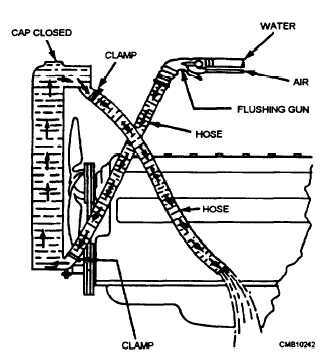 Reverse flushing of a radiator requires a special flushing gun device that is connected to the radiator outlet tank by a piece of hose (fig. 6-14). Another hose is attached to the inlet tank, so the water and debris can be directed to the floor drains. Compressed air, under low pressure, is used to force water through the radiator core backwards. The air pressure is used intermittently to loosen scale and sediment. Excessive air pressure should be avoided to prevent damage to the radiator. Starting and stopping the water flow produces a fluctuation in pressure and tends to loosen all foreign matter clinging to the passages in the radiator core. Figure 6-14. - Reverse flushing of a radiator. Reverse flushing can also be used on the engine block and head (fig. 6-15). First, remove the thermostat and disconnect the upper radiator hose. Then disconnect the lower radiator hose at the water pump. Insert the flushing equipment in the upper radiator hose. Reverse flush the system by sending water and air through the water jackets and coolant passages. Following the flushing, replace the thermostat and hoses so the system can be refilled. When reverse flushing equipment is not available, you can still reverse flush the system with a garden hose. This is often effective following the use of a chemical cleaner. Figure 6-15. - Reverse flushing of water jackets.